WooCommerce Software Add-On gives you the ability to manage license keys and activation via your store. 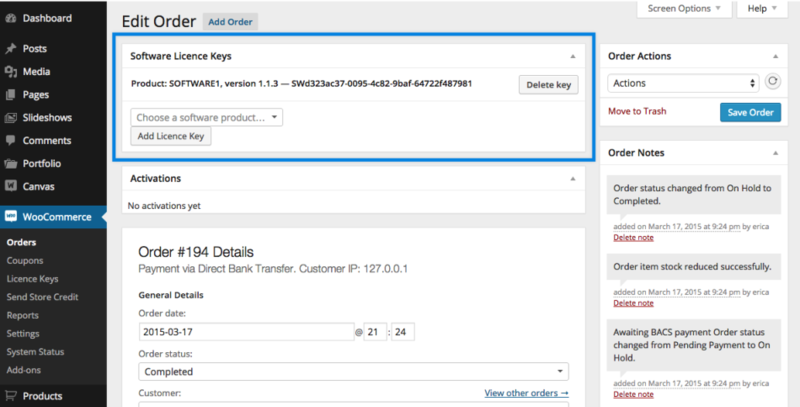 WooCommerce Software Add-On introduces a new product type called Software that lets you sell license keys. Use this in conjunction with the downloadable type, allowing the user download the product. 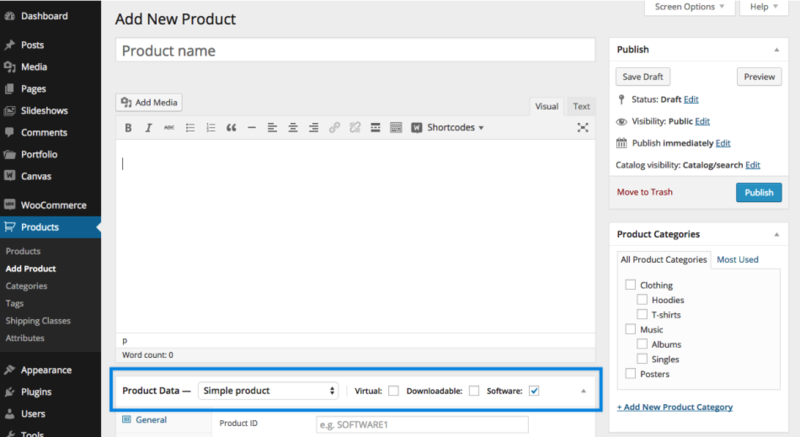 When this product type is selected, a new tab called Software opens in Product data meta box menu. Product ID – A string to identify this product. This is used by the API and should be unique to the software you sell. License key prefix – Optionally prefix generated license keys with this string. Secret key – A random string that acts as the secret key. When creating keys via the API, you need to provide this string. Version – Version number for your software. Activation limit – How many times the user can activate this software. Leave blank to impose no limits. Upgradable product – Name of the product this software is upgrading from. Upgrade price – Price for the upgrade, if it differs from the main product price. Valid upgrade keys – Valid license keys that can be used for the upgrade, separated by a comma. Used upgrade keys – Used keys are added here, separated by a comma. To manage all licenses, there are new screens and meta boxes available in the WooCommerce backend. Two new reports are available via WooCommerce > Reports in the admin panel. The first, ‘Overview’ in the Software tab, shows numbers of the software sales from your store. The second report in the Software tab called ‘Activations’, shows the activation status of your software within a certain timeframe. This screen is available via WooCommerce > License Keys in the admin panel. It provides an overview of all licenses in the system and to which product they belong. You can see all data stored within a license. The edit order screen has a new meta box that shows all licenses bought in this order. You can also add new licenses to existing orders. The edit order screen displays a new meta box that shows all license activations bought in this order. You can also toggle the status of a single activation from here. Along with the code comes a test script in the /examples folder of the plugin. This plugin allows you to post data to the API for testing purposes. Note: This is a Developer level section. If you are unfamiliar with code and resolving potential conflicts, select a WooExpert or Developer for assistance. We are unable to provide support under our Support Policy. Parameters may be added to the URL. Data returned by the API will be stored in the $data variable and is in JSON format. Please note that the parameters used below are explained above. The request_key API call can be used to generate a new license for a specific product. It returns the key and a key_id in which the license is stored in the database. The activation API call is used to activate a single use of a license. The call must contain the email address of the license, the license key and the product ID linked to the license. instance – Pass to activate existing uses (previously deactivated). If empty, new activation record is created. When empty, its value is timestamped when the request made. Note that instance is not guaranteed to be unique. platform – Decided by user. secret_key – Not used internally. Same value is sent in response. The activation_reset API call deactivates all uses of a single license. The call must contain the email address of the license, the license key and the product id linked to the license. The deactivation API call deactivates a single use of a license. The call must contain the email address of the license, the license key and the instance (set by activation call) of the activation. If the instance is left blank, activation for this license is deactivated. The check API call is used to check if a license has been activated. The call must contain the email address of the license, the license key and the product id linked to the license. It will return information about the current activations. Yes! As of Version 1.6, you can now import your own license keys! Here is a CSV sample file. To import, go to Tools > Import and select the WooCommerce Software License Keys (CSV) importer. Note this only imports licenses keys against existing orders and requires the order ID and email address to attach the license key to. It does not allow you to provide a list of license keys available for new orders. You get one license for each software product purchased. If you buy two copies of a software product, you get two licenses. Each license is good for the number of activations you specify in product settings. Via the Lost License page, which is automatically created and appears at /lost-license. This uses the [woocommerce_software_lost_license] shortcode to provide an email form to receive lost licenses. Otherwise, only the Admin can view them. Yes. To do this, you need to use WooCommerce Subscriptions (separate purchase). If you want this functionality, please take a look at WooCommerce API Manager instead. This is partially compatible with WooCommerce Subscriptions too. It works with simple subscriptions, not variable subscriptions. The API Manager also allows for the use of variable products to create multi-site licenses where the Software Add-On does not. Yes, there is a test script in the /examples folder. This plugin allows you to post data to the API for testing purposes. 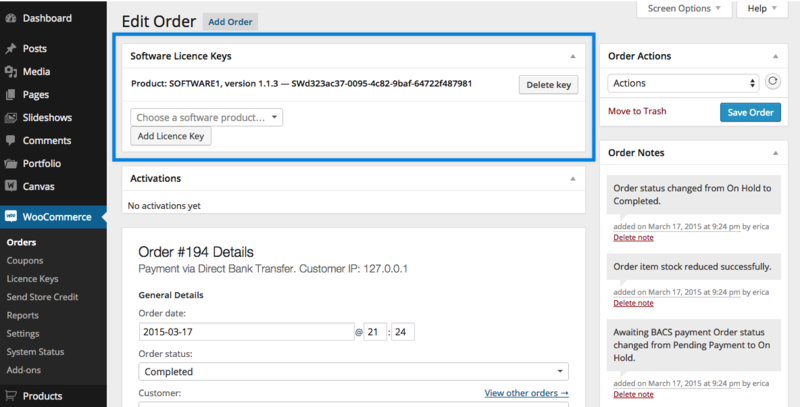 Can you import your own license keys with the Software Add-On extension? What happens if you buy multiple copies of a software product? Can a customer access their own license keys? Can I use this for downloadable digital products? Is it possible to sell the software for an initial price, then charge a smaller fee annually for renewals? Can I set a license to expire after one year? What about multi-site licenses? Is there an API test script I can look at?